Garage door springs often relax with age. Relaxed springs can result in serious safety hazards, leading to an inability to open the door or a free-falling door that could drop at any moment. 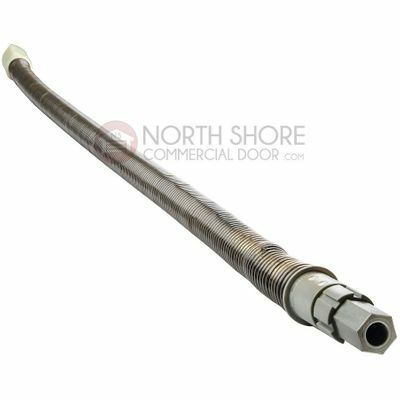 At North Shore Commercial Door, our �inventory is packed with commercial and residential-grade garage door springs that can protect your customers or your family from dangerously relaxed springs. To learn more, check out our FAQ page on garage door springs. Our inventory is full of garage door springs, universal spring cones, winding bars and more. We keep several one-piece and sectional garage door extension springs in stock, and we can custom-order parts you need that aren't currently featured in our catalog. Whether you're repairing or upgrading, you'll find the garage door springs you need in North Shore Commercial Door's huge collection. Garage Door Torsion Spring Replacement Kit Comes with Spring and Winding Bars - Max Length 39"
3/32" Cable set for 7' high Garage door with torsion springs 104"
3/32" Cable set for 8' high Garage door with torsion springs 116"
1/8" Cable set for 7' High Garage Door with Torsion Springs 100"
1/8" Cable set for 8' High Garage Door with Torsion Springs 116"
1/8" Cable set for 9' High Garage Door with Torsion Springs 128"
1/8" Cable set for 10' High Garage Door with Torsion Springs 140"
1/8" Cable set for 12' High Garage Door with Torsion Springs 164"
Garage Door Spring Center Bearing Bracket, 5"
Garage Door Spring Center Bearing Bracket, 6"